Fiorentina’s line-up was extremely surprising, as 21-year-old Brazilian Keirrison started his first game for the club, ahead of World Cup- and Champions League-winning Alberto Gilardino, Serie A’s third top scorer this season. Prandelli hinted that Gilardino needed a rest – especially ahead of the Coppa Italia semi-final second leg between these sides on Tuesday, but he was also surely trying to expose Lucio and Walter Samuel’s relative lack of pace. Prandelli went for the vague 4-5-1 he has used against bigger sides, most notably against Bayern Munich. This means that Jovetic becomes the left-sided midfielder when Fiorentina don’t have the ball, but pushes forward to become a second striker when they do, with Massimo Gobbi providing left-sided width. Inter’s shape was their 4-2-1-3, with Cristian Chivu in at left-back and Javier Zanetti restored to his central midfield position, which allowed Maicon license to get forward, safe in the knowledge that Zanetti would be covering for him. The three upfront were fluid and interchanged regularly throughout the game. 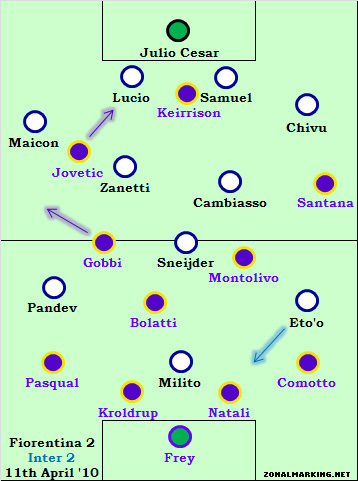 Despite Inter playing three upfront, Fiorentina’s full-backs weren’t scared to come forward, with Gianluca Comotto on the right charging up the pitch to great effect early on. It was his run that created the first goal, as he met a wonderfully weighted ball from Riccardo Montolivo, and crossed for Keirrison to tap in. Jose Mourinho will be disappointed with the goal, both because Chivu made a positional error and let Montolivo play the ball in behind him, and because Diego Milito didn’t track Comotto’s run effectively enough. Playing a fluid front three can be very useful going forward, but it is often a worry defensively, in terms of tracking full-backs. If you deploy a player solely as a right-winger, he has the specific brief of defending against the left-back, but if there is a more interchangeable front three, those players have to take responsibility and communicate about who will be tracking back – and the goal came largely because you had Milito – not a player you want defending – reacting slowly. Inter created half-chances but looked tired and off-form. Chivu, Maicon, Samuel, Cambiasso and Eto’o all had wild efforts that smacked of desperation, and Mourinho changed things at half-time. Mario Balotelli came on in a right-wing role with Chivu departing; Zanetti dropped back to left-back, and Sneijder and Pandev both played deeper. Balotelli immediately caused Fiorentina problems, and Manuel Pasqual was fortunate to escape a second booking for two challenges near the corner flag. Prandelli sensed the danger there, and immediately removed Pasqual for Felipe, generally a left-sided centre-back. Inter now had four forwards on, but didn’t look much better. Pandev was uncomfortable playing deeper, whilst Sneijder was too far from the action to influence games as he can. With this in mind, on 71 minutes Mourinho withdrew Pandev for Sulley Muntari, a holding midfielder who allowed Sneijder to get further forward. The effect was immediate, and the equaliser was incredibly similar to Fiorentina’s opener – Sneijder (in his more advanced role) fed Maicon on the right – he crossed to Milito to sidefoot into an empty net. Replace the names with Montolivo, Comotto and Keirrison, and you have Fiorentina’s goal. Perhaps Felipe’s natural tendencies dragged him inside, although in fairness he was merely following Balotelli’s run from outside to inside. Nevertheless, Maicon was unmarked in oceans of space in Fiorentina’s left-back zone, and you do have to wonder if a natural left-back would have made it more difficult for Maicon to cross. The difference was that this goal was on the counter-attack after a Fiorentina corner, but again, Felipe may have blocked the cross slightly better. But Fiorentina equalized just two minutes later with a scrappy goal from a corner kick. Julio Cesar had been troubled by crosses and set-pieces all day and again looked uncomfortable. Although the goal broke the pattern of goals in the game, it was extremely similar to a goal Fiorentina scored from a corner in Munich – the ball breaking loose from a corner, to an unmarked Kroldrup to tap in at the far post; future opponents would do well to work out why Kroldup manages to steal in unmarked. Mourinho went for broke with Quaresma on for Cambiasso late on, whilst Fiorentina had replaced Keirrison with Gilardino, but a point was a fair result. Fiorentina continue to defend absolutely abysmally, and there must be questions asked about the sheer lack of quality in the back four. Comotto, Natali, Kroldrup and Pasqual is not a back four that many strikers would be scared of facing, and they consistently get opened up easily and concede such basic goals. Having started the season with 5 clean sheets in 7 games, Fiorentina are now on a run of just 1 in 18. The injury to Alessandro Gamberini has clearly not helped, but the sale of captain Dario Dainelli in January was a strange decision that has come back to haunt them. For Inter – from 13 points clear to 1 point behind – it doesn’t look good. 3 wins in 11 games is not title-winning form, but the most alarming thing was how tired the Inter players looked at the Artemio Franchi. As Susy Campanale points out, Inter have a large squad but seem to use the same XI in almost every game, which might get Mourinho even more criticism in the Italian media if Inter, still in with a chance of winning three competitions, suffer a Leverkusen-style collapse. Hi ZM love the analysis on the site. A question not necessarily about this game but about Inter and their game coming up with Barcelona. Are Inter the perfect team to try to take on Barcelona, in that they have a manager who will surely drill them perfectly to keep their shape and keep to a presumably stifling game plan? Also, can you see Mourinho detailing someone to specifically close down space for Xavi? You can’t stop a team like Barcelona by targeting one man specifically. All their players work so hard off the ball to make space, and more importantly, passing options for one another. Their (team) distance covered in games must be very high, does ZM have any stats on that? When Iniesta’s not playing everything goes through Xavi, so shut him down and you shut down Barcelona. Messi is forced to drop deeper to pick up the ball which keeps him further from goal where he’s less of a threat (not no threat, but less of one). Then all you’re left with is playing balls into wide areas and getting crosses in, which is hardly Barcelona’s strength (Ibrahimovic is good, but not great, in the air). Of course when Iniesta plays they possess too many weapons to just focus on shutting down Xavi, because Iniesta’s passing can be more dangerous than Xavi’s. Could explain why Barcelona still believe Fabregas could play a role for them even in this side. The introducing of Balotelli changed the direction of the match, his speed and power exploited the weakness on Viola’s left hand-side. There wasn’t much can do for Prandelli with the players in hand though. Swapping Dainelli for Felipe is a doubtful decision, however, Dainelli is not good at defending quick and agile players which probably wouldn’t help against Eto’o (though he is good at defending high balls). I think the problem lies more within the time that the centre-backs had played together. Viola has a lot of changes at the back four which is not very good. The loss of Mutu imposed a lot of problem on the attacking side of Fiorentina too, new tactics hasn’t been practices and tested enough. Using Kerrison is a strange decision, he is lack of ability to play with his back facing the goal, which is exactly what is required to play in the Fiorentina system. He still have one year left on loan, let’s see what Prandelli will do with him. In this match Montolivo showed very good form with some clinical passes. Bolatti, however, lost his position too often for a DM. It’s funny to see that De Silvestri subbed Santana. How many times have we seen a full back plays as a winger in Fio? Apparently Internazionale is not in good form, especially Cesar who had a handful of mistakes in this single match. If Inter do not find a way to deal with this, they will have a hard time in the cup semi-final. What I am thinking is, probably neither cup or league is not the first priority for Inter, only the Cup of Big Ears is what Mourinho (and Morrati) really want. Aaah I see, sorry – yeah that will be up tonight or tomorrow morn depending on traffic. Can you offer an explanation as to why Julio Cesar struggled so much with crosses/corners? Cesar has been off all season. The performance he put on against milan in the 2-0 win is characteristic of his usual high standards. But other than that, he hasn’t looked great – not even close to the superhuman form he was in last season. Confidence crisis maybe? ZM points out correctly that this inter team looked tired. It’s not easy playing 2 games a week in this physical style and this inter team is thin in terms of quality midfield players that can keep possession. Also, Milito (who is always a lockon to start, and gets the brunt of the knocks) in particular looks overworked. I am not a big fan of Zanetti playing in midfield. He may free up maicon but he’s really not particularly helpful in attack. Playing Stankovic takes some burden off Sneijder and he’s not too shabby at defending either. Against Fiorentina everything went through the dutchman and that was a little predictable though still effective. But still, zanetti is el capitano and he will always start. Against barca he should be in midfield because he’s not great at defending at left back (see inter’s game against rubin) and mourinho wouldn’t want messi to stomp all over him. Chivu on the other hand managed to shut messi out at the san siro earlier this season. He was great at left back and in that sweeper role. He’s just rusty. Fractured skulls do that to you. Good point about the physical style and lack of ability to keep the ball in relation to fatigue. As shaky as Julio Cesar has been, I don’t recall him having that particular problem. Most of his lapses have been physical mistakes (usually holding onto the ball) but he usually knows how to defend a corner. When Inter do not need Zanetti’s cover in defense (like against CSKA), he shouldn’t play in the midfield. However, he will be crucial in the Barca match. After Cambiasso, he is the best ball winner Inter have. Stankovic has not found consistency since returning from injury, but he’s probably the only other Inter midfielder who can win the ball and maintain possession. Motta is far too slow to win the ball off of good teams (but he bosses the midfield against the likes of Bologna) and Muntari has no clue what to do with the ball when he wins it and is a sending off waiting to happen at all times.